"Our world-class customer service isn't automated... It's automatic." 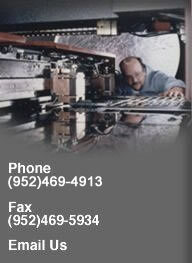 Our metal stamping services have long been our primary focus in partnering with our customers. We have a wide variety of equipment to handle all of your metal stamping needs, including shallow drawn stamping and heavy metal stamping. 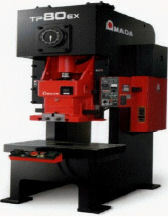 For a complete review of our metal stamping machinery, please see our Equipment List. Stampings of Minnesota's punch press operations deliver uncompromising precision in our metal stamping production process. 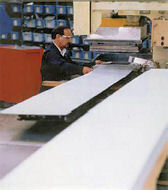 In all, we are able to offer stamping services on over 45 presses ranging in production capacity from 10 to 220 tons. Our customers in these industries have come to us for metal stamping products and services that are delivered on time, in dock-to-stock quality. And, our customers have stayed with us for decades because we have delivered unmatched customer service, at competitive prices on every stamping order. We also invite you to visit our Parts Gallery for images of sample parts produced in our press department. Stampings of Minnesota's press department is supported by an in-house tool & die shop. As a result, we are able to offer a wide variety of production options including staged tooling operations as well as progressive tooling.